The History of England (Originally titled The History of Great Britain) (1754-62) is an enormous History of Great Britain, tracing events from the Saxon kingdoms to the Glorious Revolution. It was a best-seller in its day. It was written by David Hume (1711-1776) an 18th-century Scottish philosopher, economist, and historian, considered among the most important figures in the history of Western philosophy and the Scottish Enlightenment. More a category of books than a single work, Hume's history spanned from the invasion of Julius Caesar to the Revolution of 1688 and went through over 100 editions. Many considered it the standard history of England until Thomas Macaulay's History of England. 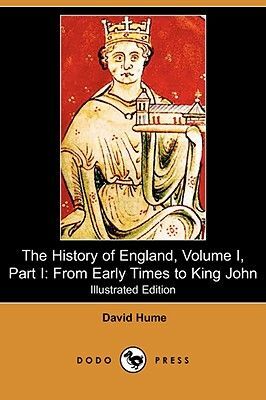 A great historical work The History of England, would take fifteen years to complete and run to over a million words, to be published in six volumes in the period between 1754 and 1762. Later it was continued and published as the first of 3 volumes, the second by Tobias Smollett (1721-1771), the third by Edward Farr and Edward H. Nolan.